Experts talk a lot about the need for interactive playtime, which is when you play with your cats using toys. Waving a wand around, or rolling a small ball across the floor, are great ways to play with your cat, and help enrich his life. However, cats amuse themselves, too, and watching cats amuse themselves is, well, amusing. It can also provide a different type of enrichment for your cat. I have no idea about anybody reading this blog, but I love watching my cats amuse themselves. To me, it’s hilarious. They still get their interactive playtime, but all four of them are capable of finding something with which to amuse themselves. Sometimes, their antics are the best thing for me when I’m feeling low, because they’re so silly about their personal playtime that I can’t help but laugh. It’s amazing the imagination that pets have, and how easily cats amuse themselves. 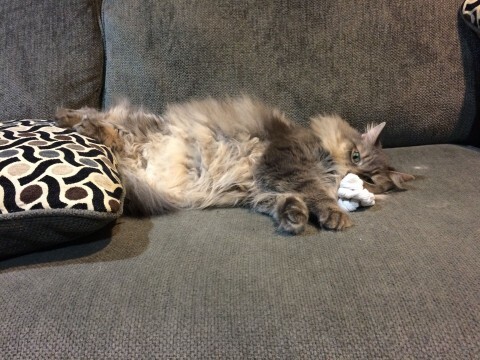 Linda Cole, writing on Canidae, not only swears that her cats spy on her neighbors (I’m pretty sure mine do, too), but she also says that one of her cats would take the end of a new roll of toilet paper and wind it around the house. She always managed to do that without tearing it, but since she’d wind it around the legs of tables and chairs, that must have been so much fun to clean up. Sometimes I’ll find Kali up on top of the refrigerator when there’s a bug crawling on the kitchen light. She never jumps for it (I think she knows she can’t make it), but she’ll sit there until she’s sure the bug is gone. I’ve seen her sit up there, as straight and alert as possible, for an hour before she was sure the bug was gone. Cats will always need interactive playtime; it’s never a good idea to assume that they can always amuse themselves. But when you’re lucky enough to see cats amuse themselves, it’s a treat for both you and them. Cats and Cucumbers: WHAT is the Story? What is up with cats and cucumbers? 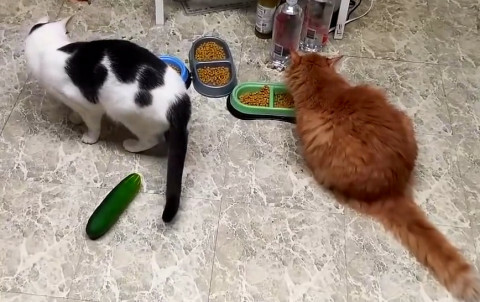 Videos have been making the rounds of the Internet, showing cats that get freaked out by strategically placed cucumbers. They don’t smell especially strong, and they’re not exactly big and towering, and yet, when cats see them, they freak. What on earth is going on? It’s like the cat circles phenomenon, where people would try to “trap” their cats inside circles made of tape, ribbon, rope, or anything else cats could step over easily. It doesn’t work with all cats, but it does work with enough that it became an Internet phenomenon. Cats and cucumbers is very much like this; many cats react, but some don’t. 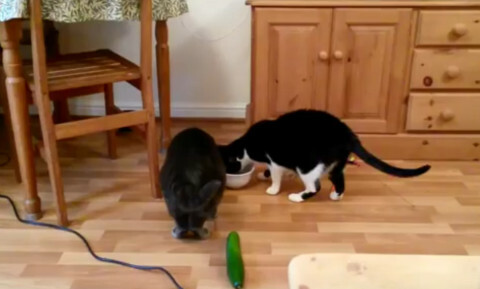 Watch the compilation below to see the ways that some cats react to cucumbers. This brings up the main question: What is it about cucumbers that’s so scary? There are a few theories, one of which has to do with a possible resemblance to snakes. Seeing a cucumber appear behind them might trigger some sort of reflex to avoid snakes. It’s also possible that the cucumber is an object that just magically appeared, from the cat’s perspective, and that alone is enough to startle cats. This is such a popular phenomenon that there’s even an entire subReddit devoted to it. It comes complete with a disclaimer that, sadly, applies to us and our cats: “This is /r/CucumbersScaringCats, not /r/CucumbersNOTScaringCats. If the cat isn’t scared, it doesn’t belong here.” Maybe some have tried to prove there that cats and cucumbers aren’t always a thing? However, it’s not a good thing that this is taking the Internet by storm. National Geographic ran an article about this, which went after people who were intentionally scaring their cats with cucumbers. Jill Goldman, a behaviorist in Southern California, says that if you’re causing your cats stress this way, then it’s probably not a good thing no matter how funny it seems. One of the problems is that people are putting the cucumbers behind their cats while they’re eating. Cats associate their feeding stations with safety and security, according to the National Geographic piece, and people are intentionally scaring their cats in those places. That’s cruel, and could potentially cause behavior problems. So, while cats and cucumbers take the Internet by storm, beware of doing this to your cats. Cats’ fear reactions can be funny, but in the end, are not really worth it. You want them to feel as safe as possible.